These math problems are really confusing me because I simply cannot figure them out. I thought I understood today’s lesson, but tonight’s homework contains new charts and figures that confuse or make no sense to me at all. Does my teacher mean to confuse or make things unclear for me by giving us such advanced problems? I did my best on this, but I think my answers are going to confuse or mix up my teacher! Quiz: Try again! What is going on if something is confusing you? There is something which is not clear to your mind. There is something that is giving you a headache, such as music that is too loud. There is something in a book that is puzzling, but only for a moment or two. If something confuses someone, he really doesn’t get or understand it because it is unclear or he cannot figure it out. NSGOCFNUI? You would probably be confused if you saw the letters NSGOCFNUI, or at least until I told you that they were simply the word "confusing" all mixed up. If someone were to “thoroughly pour” information into your head, you might be confused because there was just too much information to understand or grasp, that is, your mind wouldn’t be able to deal with it all. 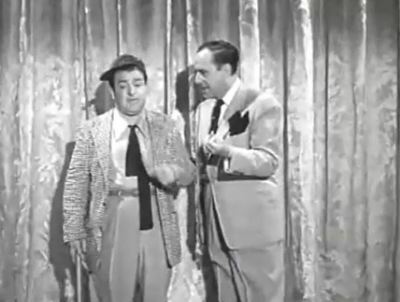 The Abbot and Costello Show "The Actors Home" 1953 The guy with the baseball bat is getting more and more confused.